Greetings from the Cricut Stampede! Adios! I'm off to the Texas Cricut Stampede! 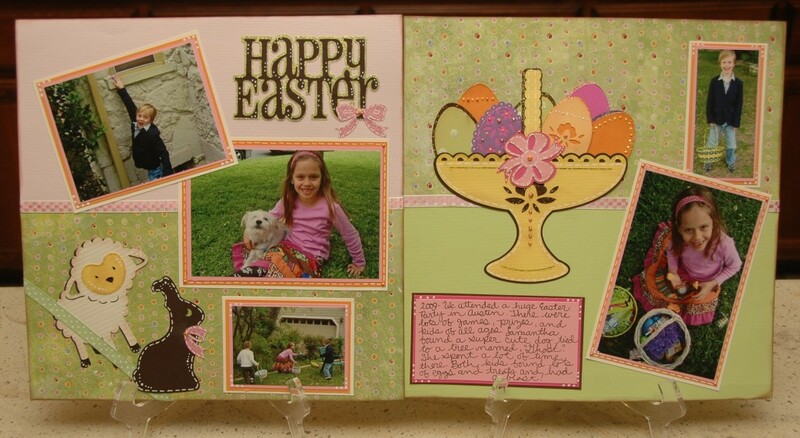 Card with "A Childs Year"
Blog Candy Cart, Free Directions, and a Video! Ok-This is Wendy and this Guest Designer is a little special to me!! 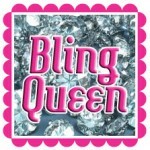 She is the "Junior Bling Queen"
Yep-that is right My daughter Maddy. Well tonight she had a talent show and can I say-"The kids RAISED THE ROOF" She must have thought about that when she did this card.. She used the paisley cartridge and cut the lady bug at 3" and added bling for the eyes and the ends of the antenna's. 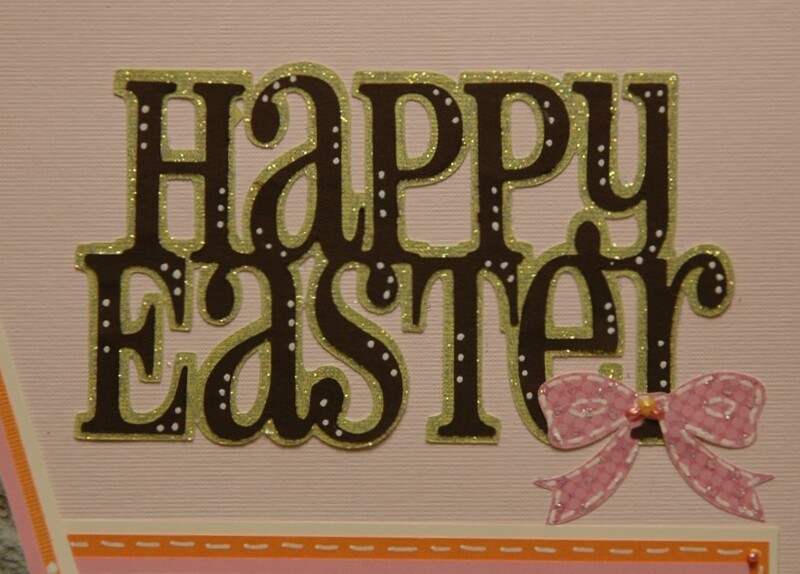 The paper was a mix of Stampin Up and Pink Paisley. 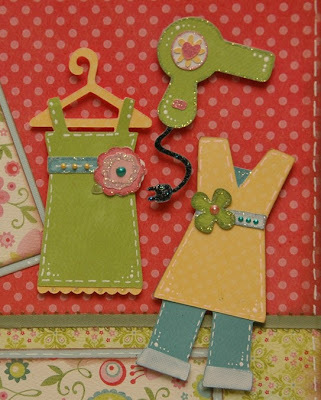 She also added the few buttons and ribbon to make it pop. 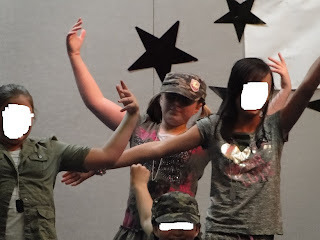 This is her dance recital from last July with my bff and her adopted "Auntie Mo". Don't forget to come visit me by clicking HERE. I have a HUGE giveaway and today-Friday, April 1st is the last day at 12 midnight. "This layout was so much fun to do. I love the colors, and the cartridge is awesome! I found these pictures of my kids from last Easter and just had to do something with them. I used my daughters skirt for the color scheme. I absolutely love the way it turned out. Hope you like it!" Be sure to leave a comment on today's post to be entered for this week's blog candy - I'll be giving away 4 Cricut magazines. And check back tomorrow for another fabulous Guest Designer!! 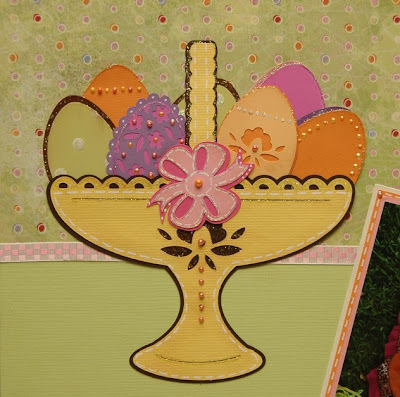 -Basket, shadow, and bow 6 1/2"
-"Happy Easter" and green shadow 2 1/2"
-Eggs and egg shadows 2 1/2"
-Pink bow on title and bunny 1"
Green polka dotted ribbon 6 1/2"
Just a fun birthday card-For this card I used Birthday Bash and cut the card at 5 3/4". It is a great scallop card. The gold paper I created by just fan folding a strip of paper that was about 1/2" in width and used it all around the circle. I used several strips. The cupcake was cut with Sweet Treats at 3". I did emboss and stickle. Today's project is brought to you by the uber-talented Nana Susan. Let's hear it for Nana Susan! Woohoo!! And don't forget to leave a comment today for another chance to win 1 of 4 Cricut Magazines that I'll be giving away this week. See yesterday's post for a thorough review if you haven't already. 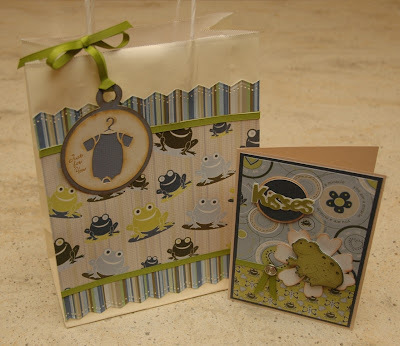 Susan made this adorable card and gift bag using papers from Cloud 9 Design - the Baby Boy line. What is it about going to a baby shower that makes us want to go all out and bring the cutest gift??? I have no idea, but this would certainly get a lot of ooooh's and aaaaaah's before the gift itself even made an appearance. The tag on the bag was made from the New Arrival cart, cut at 3", and the shadow was cut at 2 3/4". She originally cut the shadow at 3", but said it's a very fat shadow, and she wanted to tone it down a bit, so dropped the size. She used coordinating paper, a border punch and ribbon to complete the bag. Simple, yet fabulous! The card is 5 x 7. "Kisses" was cut from the Sweethearts cart, and she just cut off the "Hugs and" part of it. The blue circle is from George, cut at 1 3/4", and the frog is from Animal Kingdom, cut at about 2 1/4". The ribbon and brad are from Stampin' Up. Thanks for stopping by today. Be sure to check back tomorrow to see what Wendy has in store for you! Happy Monday, Cricuteers! Alrighty, so Cricut Magazine contacted me and asked if I would review the newest volume (April/May) of their magazine. I said "of course!" and they sent me one to review and a few extras to give out as blog candy. Sweet!! I have FOUR copies to give out this week, so be sure to leave a comment today, and come back each day this week for more chances. I will say first of all, the the magazine is beautifully published. It's put out by Northridge Publishing, and they've been around for quite a while, so it looks very sharp, the editing and photography are all top notch, etc. The other nice thing is that it's not just full of advertising like some magazines are. There's actually not a whole lot of advertising - maybe just 10-12 pages out of 130 pages, and even those ads are relevant, so it's not bad at all. Perhaps that's why the magazine is a wee bit on the pricey side at $14.95 newsstand price, but it is more like a book AND you can get it for quite a bit cheaper per issue if you subscribe. 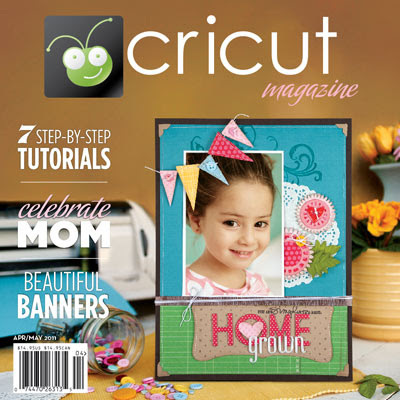 Cricut Magazine is quite full of bunches and bunches of useful ideas, and there's quite a variety, so there would certainly be something for everyone. There are altered projects, cards, layouts, even fabric projects. I personally am a huge fan of layouts, and the ones in the magazine are great, but most are 1 page. There are some 2 page layouts, but I'd like to see more. My years of teaching with the Cricut have shown me that most people prefer 2 page layouts. But you can always adapt the 1 pagers and make a coordinating second page. The cards are varied - some simple, some a little more detailed, so again it's a good variety. There are a few places in the magazine where they really dig in to show and explain some cool techniques step by step. For instance, they show how to use Tim Holtz grungeboard in your Cricut to make some beautiful dimensional flowers, which are stunning! They also show step by step instructions to cut fabric in your Cricut and make the most adorable little baby onesies. That's very useful information, and certainly would cost you less than paying for a class. In my opinion, the one thing they could improve would be the consistency in providing detailed information in the directions. Some projects have Cricut cut sizes listed, and some mention only what cartridge the cuts are from, but no sizing. However, I think they might be working on making that a little more consistent for future issues - I hope so. The only other thing I noticed was that some of the projects are very Cricut-focused, and on others, the Cricut work looks like more of an after-thought. 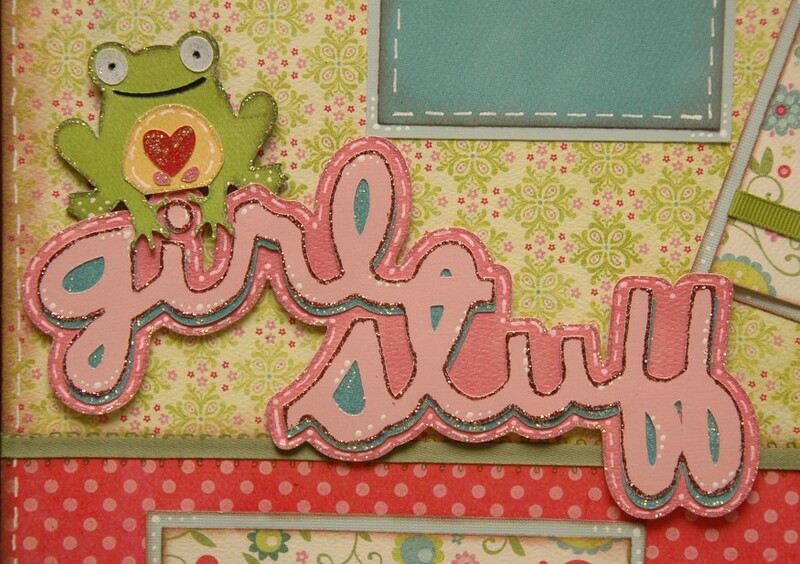 So maybe it's a beautifully detailed layout, but just has one little Cricut cut on it. No biggie, though, and by far most of the projects are pretty Cricut-centered. Overall, it's a fabulous magazine, and there's plenty of "meat" in it - both for the beginner and the more advanced Cricuteer. This is really what all of us Cricut fans have been begging for for years! I'd say it's well worth the money for the ideas, and especially for the step-by-step techniques they include. I looked in the magazine, and it says you can call 1-888-225-9199 to subscribe. Or you can do so online HERE. It says it's $39.95 for 6 issues (=$6.65/issue), $74.95 for 12 issues (=$6.25/issue), $109.95 for 18 issues (=$6.11/issue), or $144.95 for 24 issues ($6.04/issue), and I believe it's published once every 2 months. Also, HERE is the link to their Facebook page so you can "Like" it and find more info. Who else has received the new Cricut Magazine, and how do you like it? Are you all excited to win a copy?? And btw, if you'd like to submit projects to be published in the magazine, HERE is the link to their submissions page. We've got a winner for this week's blog candy, which is a Basic Gray paper pack. Please email me at moniquegriffith@yahoo.com with your shipping address. Congrats!! I love it I just bought the Paisley cartridges. Be sure to check back tomorrow. I will be reviewing the newest edition of Cricut Magazine, and will have blog candy to go with it. Hmmmmm. Team Monique was started by my good friend, Stephanie Culton (who also put together the above video) last summer after I was diagnosed with Stage 3 breast cancer. We did the 5K Race for the Cure in San Francisco to support the Susan G. Komen Foundation. 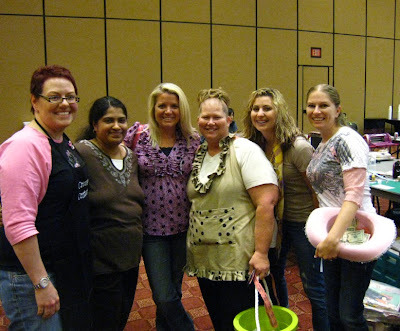 We had the largest friends and family team with nearly 50 members and raised about $9400. This is where a HUGE chunk of research funding comes from, and honestly, what better way to help find a cure??? Did you all know that 1 in 8 of us women will be diagnosed with breast cancer at some point in our lives? (And you don't need to be over 50 to qualify - I'm in my 30's!!) I don't know about you, but I know a lot more than 8 women, and it breaks my heart to know that such a huge percentage of them will have to go through what I just went through. But they are making progress through the research - both toward finding a cure AND through early detection and improving treatment. It made a huge difference in my treatment, and you just never know which 1 of your 8 closest friends or family members will need that same support. Because this is not money that goes in my pocket, and because it's SUCH an incredibly important cause, I would really encourage you to support us in our fight. Seriously, even if it's $1 or $5 - maybe it just means giving up a coffee today. Look how many followers we have on this blog - that would really add up and make a difference! I have been through a LOT in the past 9 months - being told I most likely had only 2-5 years to live, going through super aggressive chemotherapy, double mastectomy, and then twice-daily radiation for 5 weeks. I won't lie - it wasn't a big party. BUT I chose to look for the blessings in life, and I vowed to work on finding some good in a bad situation. This is that good. This is how we can make a difference. It's a miracle that I'm still here, and I've been declared "No Evidence of Disease" and that is in large part because of the improvements in research and treatment. (We all know it's also because of the massive outpouring of support and prayer too!) Now I actually have a decent shot at watching my daughter grow up, and I am so thankful for that! 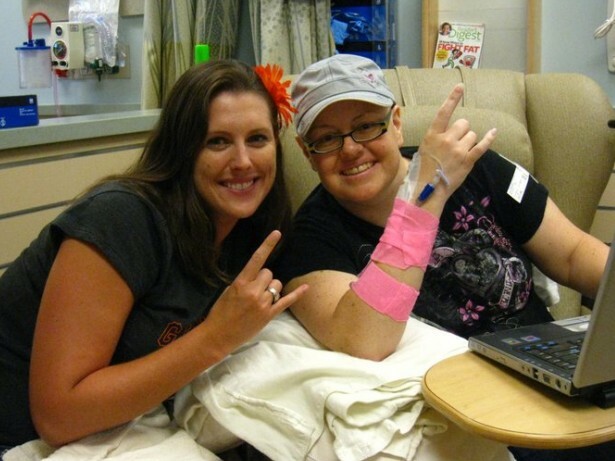 Stephanie and me on chemo day. Rock & Roll, baby! To support our team, you can donate by going to my personal fund-raising page HERE. 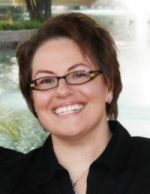 Or you can go to our team page HERE, and click on any name to support them - it all goes toward our team and the cause. Or you can even join Team Monique if you'd like and help us with further fund-raising. If you're local and want to join, we'd love for you to come walk with us on May 7th in Sacramento. If you're not local, you can still join and help out if you want to by doing "Sleep in for the Cure" and getting your friends and family to support you. Or just keep it simple and make a donation - I'm not picky! 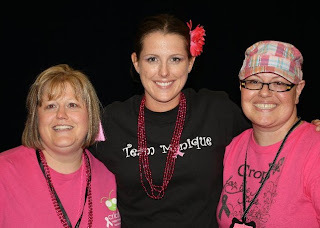 From now until May 7th, if you make a donation to Team Monique, I will send you a free set of directions to the Tuff Girl layout pictured below or any of my Cricut project kits ($10 value). Just email me at moniquegriffith@yahoo.com, and let me know that you donated and mention which project you'd like the directions for. We are also doing a "Crop for the Cure" event on May 1st. 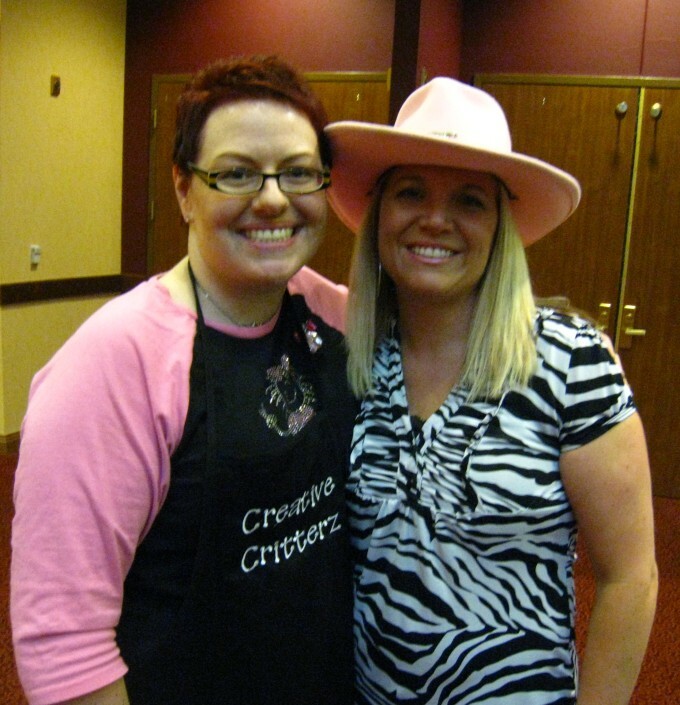 This is an all-day Cricut crop and silent auction, and it sold out over 50 spots in ONE day. We have some amazing companies and individuals contributing items for the silent auction such as Tim Holtz, Provo Craft, My Pink Stamper, Cricut Magazine, Oh My Crafts, Expressions Vinyl, Echo Park, and many more. If you have something you'd like to contribute to the silent auction on May 1st, you can email me at moniquegriffith@yahoo.com. Thanks for stopping by today, and thanks for all of the support!! This is Edna from Create With Expression today I will be sharing with you all a two page scrapbook layout that I created with Birthday Bash and George Basic Shapes, my inspiration for this is my Grandson and getting ready for his first birthday even if it's not until November lol!!! All my papers are from Core-dination, JoAnne Open Stock, DCWV Glitter. 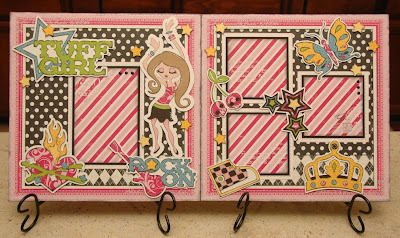 Some of my other tools I used are Glossy Accents, Stickles, Black Brads, Gelly Roll pens in Black and White, and also My Pink Stampers Sweet Baby set for the (Happy) around the page. Wow! that was alot lol! 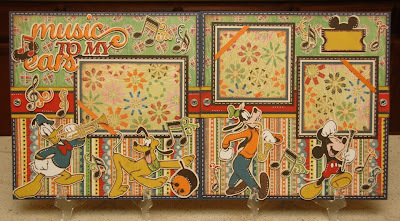 and I just added the brads to the Banner and then a touch of Stikles here and there with the Glossy Accents, I am very excited about the turnout and hope that you all are inspired and excited with me :) again I want to thank Monique and Wendy for inviting me as a Guest Designer today and you are ALL AWEWSOME !!!!! Oh, I think you might just like this one! This is a stinkin' cute layout by our fabulous new designer, Becca Rees. I'm tellin' ya - she's got some talent goin' on! See below for all the details so you can make it yourself. 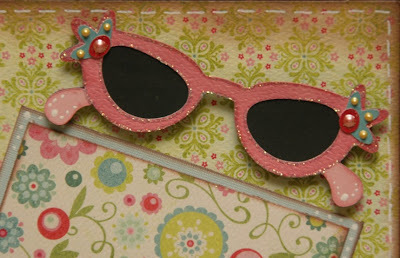 And don't forget to leave some love for Becca by leaving a comment - and it will also enter you for this week's blog candy - the brand new "It's My Party" paper pack by Basic Gray! Bring it! And be sure to check back tomorrow for a special Guest Designer. And just to tease you some more because I'm a big meanie, I am going to do a review of the newest issue of Cricut Magazine and will have a few copies to give away too, so check in for that either Saturday or Monday. Lots of good stuff goin' on! 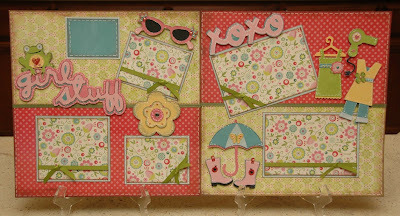 Becca says she was inspired to make this layout by her daughter's favorite colors and love for girlie stuff. 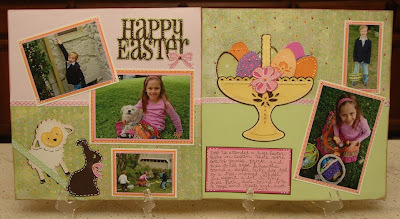 She used the Paisley Cartridge, My Mind's Eye Paper - Quite Contrary Line, and Bo Bunny Cardstock. Olive Green Ribbon 2 ft. Smaller Yellow Flower 1 1/2"
Have fun scraplifting!! Btw, are there any certain themes of layouts you'd love to see? I'd love to design another layout just for fun that you can scraplift, and I always enjoy hearing about what you'd really like to see more of here. Thanks! Hello Everyone-Hope you are having a great day or getting ready to start and awesome day. I made this card to show you a simple card. 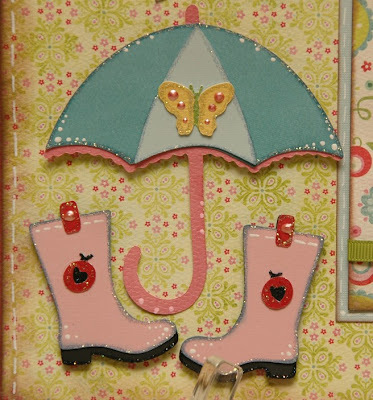 I saw a card similar to this in a magazine and to be honest I could not find it when I wanted to scraplift it-well since I did not find it I had to just do what I wanted. 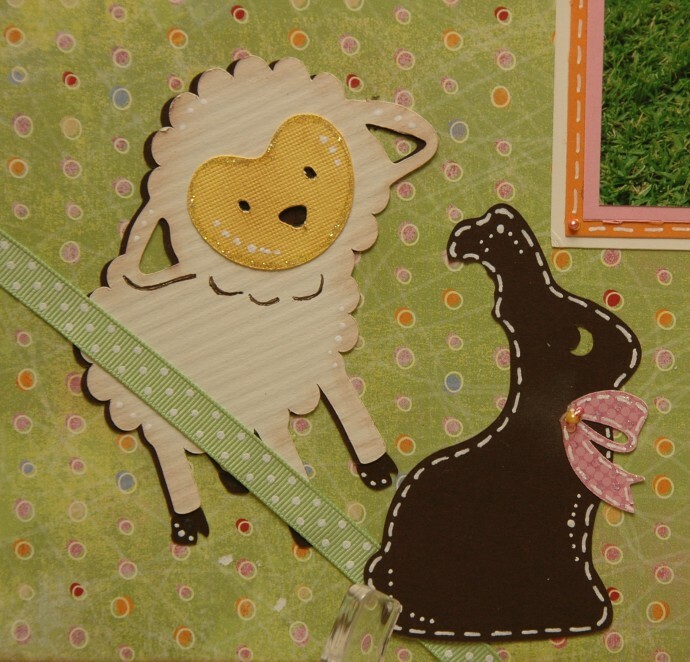 The paper and ribbon I used is an order line called B-Day Bash by Imaginisce. The Elephant was cut at 4 inches using the cart Birthday Bash. 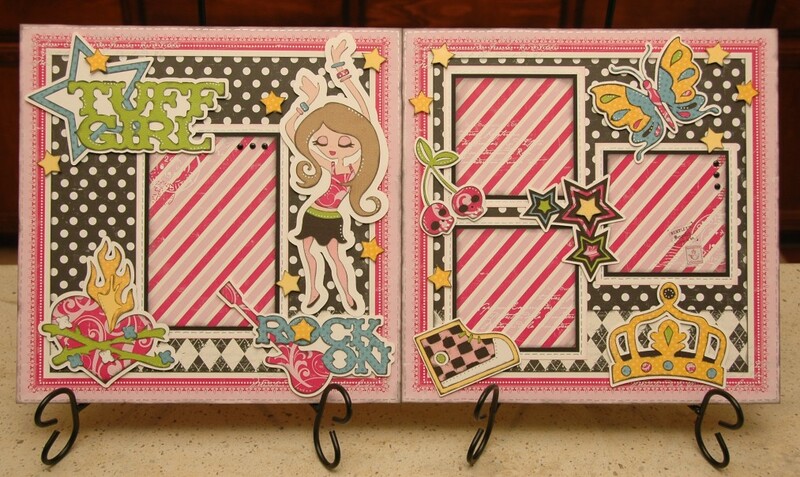 You guys will notice that the stamps I normally use are from My Pink Stamper but believe it or not-I have NONE that say Happy Birthday so I had to use a Stampin Up stamp. I used pop dots on the ear of the elephant and the sentiment. For those of you that have asked about my FROG....(item holding card) I found it at a local antique store. 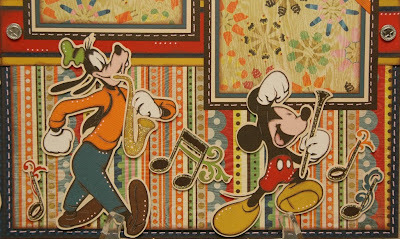 Music to My Ears - Disney Layout - Plus New Blog Candy! I got home from Texas about an hour ago. And yes, right now it's about 1:20am, which is equivalent to 3:20am Texas time. Guess it might be time for a little sleep! So for now, I'm going to do a quick post and show you the layout I made last weekend when I was at the Lake Tahoe retreat. 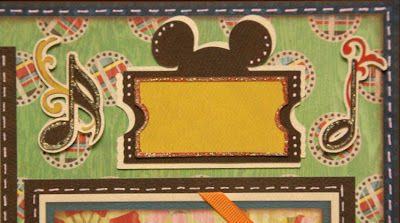 This layout is for Kathleen in New Jersey. 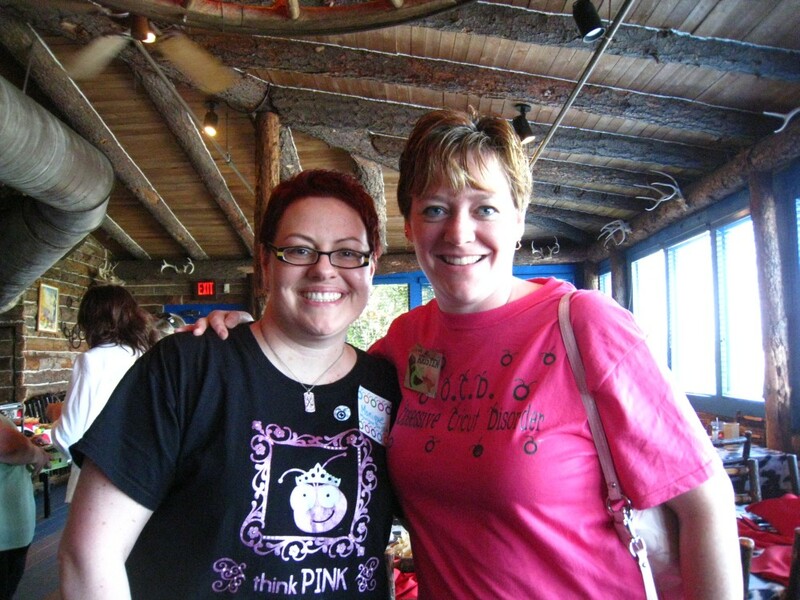 She was the winner of the custom layout prize, and she chose a Disney music themed layout. Her son is going to be in a band competition at Disneyworld soon. 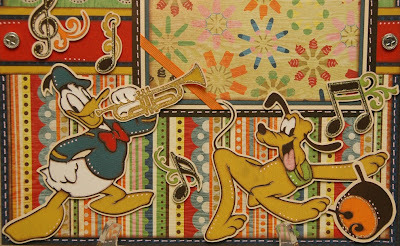 So I combined the Mickey & Friends cart and the Quarter Note cart for a little music magic. Hope you like it!! And btw, this week's blog candy will be the Basic Gray paper pack that I used to help make this layout. It's called "Life of the Party". It's brand spankin' new, and super duper cute and useful. It retails for about $20 or so. Just follow this blog and leave a comment to be entered. Plus you can come back each day for more chances. Of course all of the characters are from the Mickey and Friends cart. I believe Goofy was cut at 6". Mickey and Donald were 5", and Pluto was at 4 1/2". I actually used dark brown chalk ink and inked EVERY single layer of the characters - even the eyes and tongues. Eeeek! So yes, it took me all day to make this, but I loved every minute of it. I lined them all up like they're in a marching band, and gave each character an instrument, placing it in their hands the best that I could. 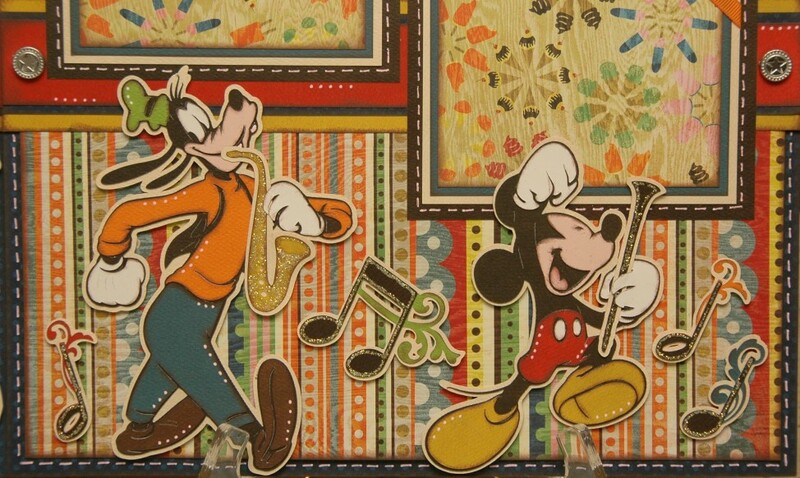 Kathleen's son plays clarinet, so that is the instrument that Mickey has. I was trying to come up with a cute title, and then saw it staring me in the face. 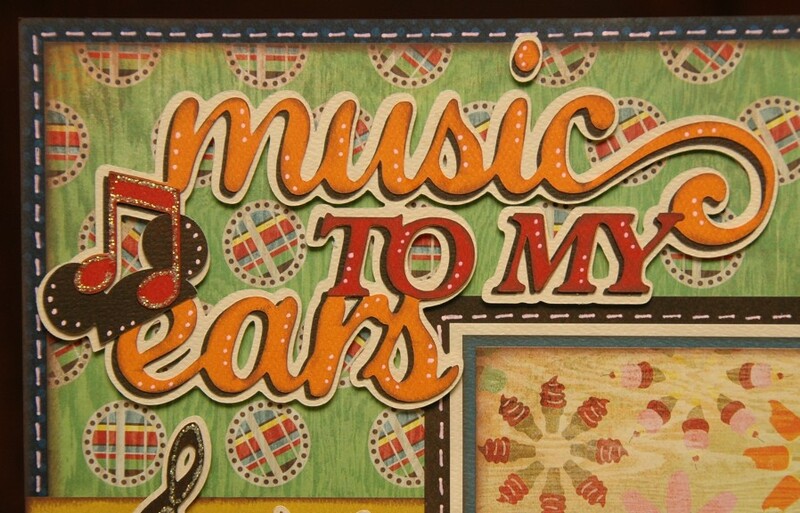 "Music to my ears" - how perfect is that???? So the title itself is from Quarter Note (cut at 3 1/2"), but I spliced the mouse ears into it from the Mickey cart. I also added extra layers to give it more depth and make it stand out. Normally, this title would just have 2 layers - the ivory and the orange. But I added a dark brown layer off-set under the orange, and then cut out the title again in red, and cut away the pieces I wanted and added those on top of the orange. Not sure if you can tell, but the instruments are all Stickled to make them a bit more festive. I thought it looked especially good on the brass instruments. I also shadowed each character to help separate them from the busy background paper. And also added white dots to bring a bit more life. 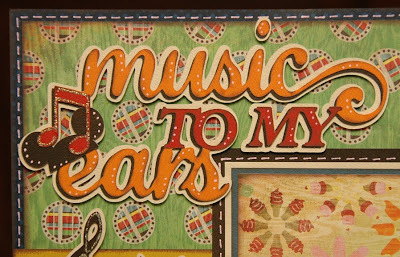 The fancy shmancy music notes were all cut at 1 3/4". 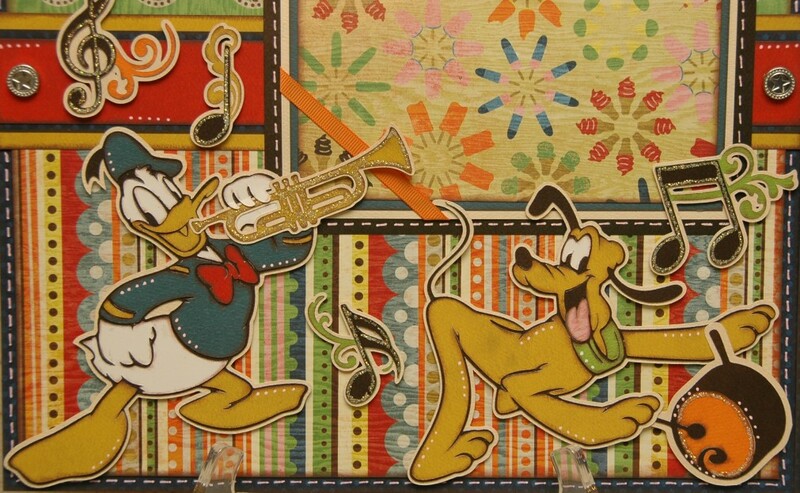 Goofy is on the saxophone, and Mickey leads the way with his clarinet. All characters were pop-dotted. Mats are quadrupled to help them stand out against the background and also to help disperse the different colors throughout the layout. 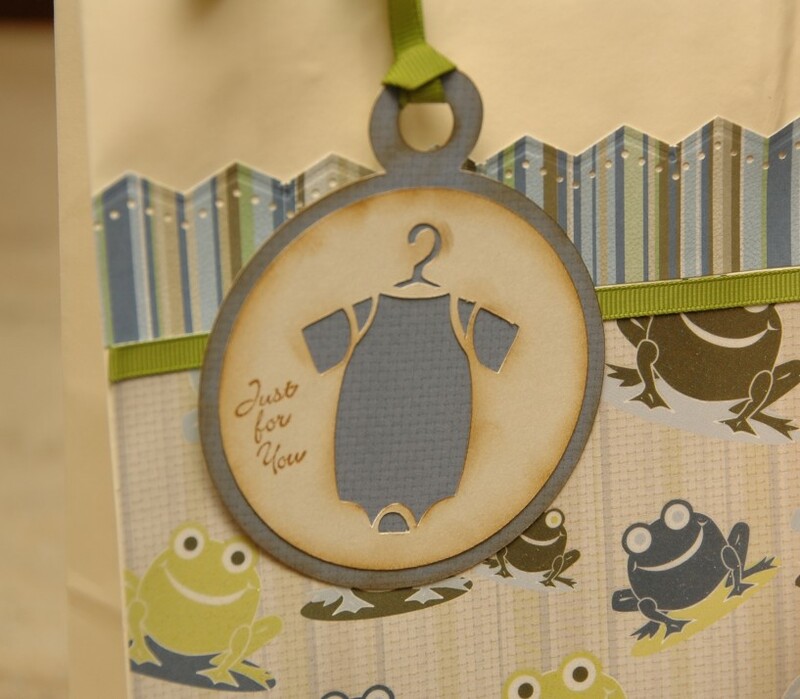 I used white faux stitching on the mats and around the background. 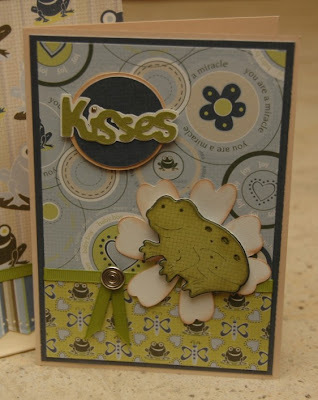 The silver brads and orange ribbon are from Stampin' Up. 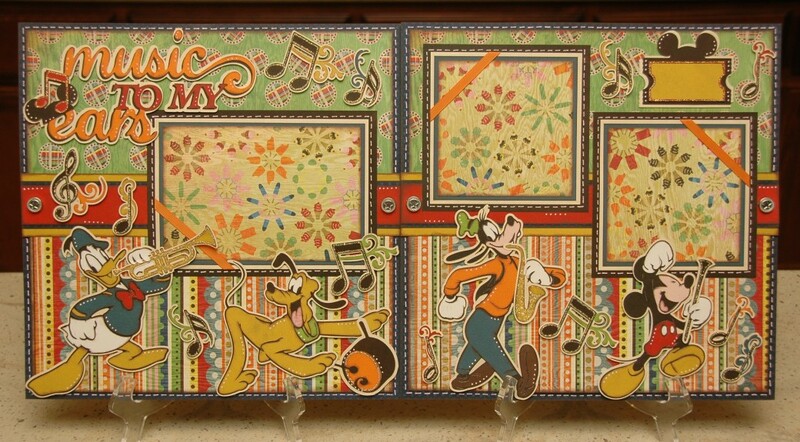 This journal box is from Mickey and Friends. Or was it Mickey Font? See - I definitely need some sleep!! I hope you all like the layout. And Kathleen, I'm especially hoping that you and your son love it. I will work on getting it shipped off to you this week. Nighty-night, all! Last of the Stampede Memories. Plus blog candy winner! It's late Sunday night, and we will be leaving Texas tomorrow and headed for home. It has been a seriously amazing trip. I wish you all could have come, and I know it's just not always possible. But if you do ever get the chance to come to something like this, you have GOT to do it. What an experience!!! Tammy Skinner and her gang did an incredible job! And I have loved meeting so many people. I'm tellin' ya - there's nothing like it! 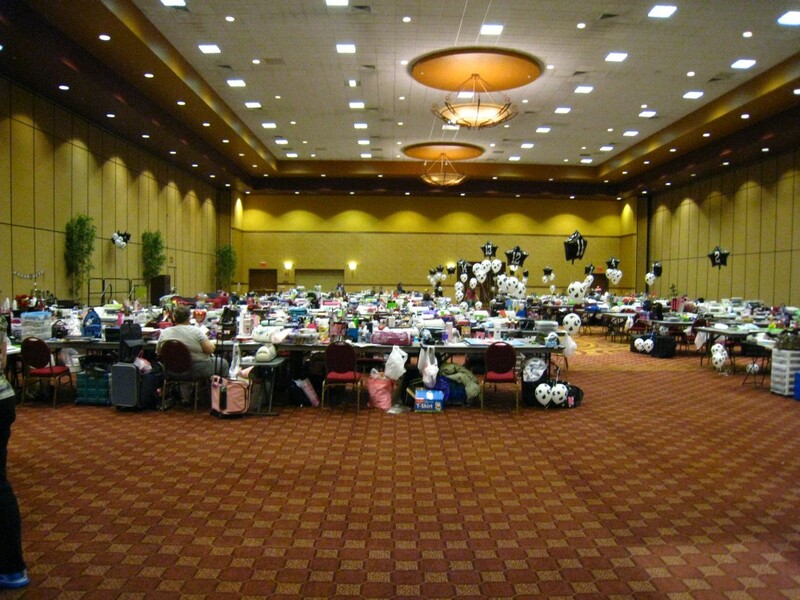 The Craft Room for 200 Cricuteers!! So yesterday, Nana Susan and I helped out with the make-n-takes, and then went to the Cowboy dinner, which was such a hoot! 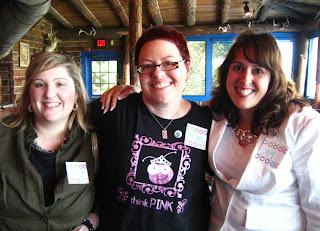 We sat at a table with Scrapalette, Jana from Provo Craft, Flywhistle, Softbrn, and a few other fabulous ladies who were just a pleasure to hang out with. The food was great.... and THEN... wait for it.... no, say it didn't happen.... oh yes, it DID.... they made me DANCE!!! (This is where you run away screaming in terror.) The DJ told everyone on the dance floor to go grab someone who wasn't dancing, and I knew Robyn was going to come and pull me out there. She should know better! 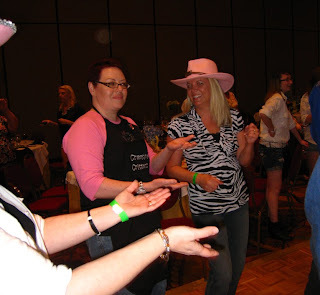 So Robyn taught me to do the macarena. Some other friends, including Karlee, Kristen Long and Angie - also taught me some moves. So, even though I know I looked like a big dork, it was actually really fun. Thanks, girlies! 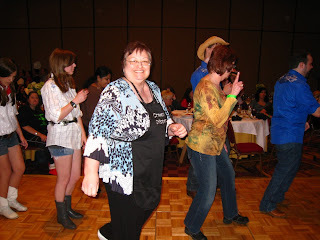 Nana Susan jumped right in to the line dancing. 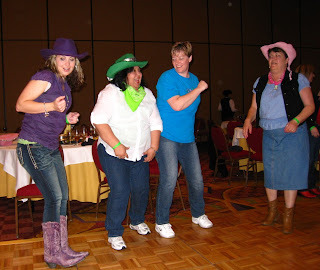 My dance instructors - Karlee, Angie, Kristen and I think it's Linda on the end. Me and Robyn. I just love her! Hope Winfield and me. 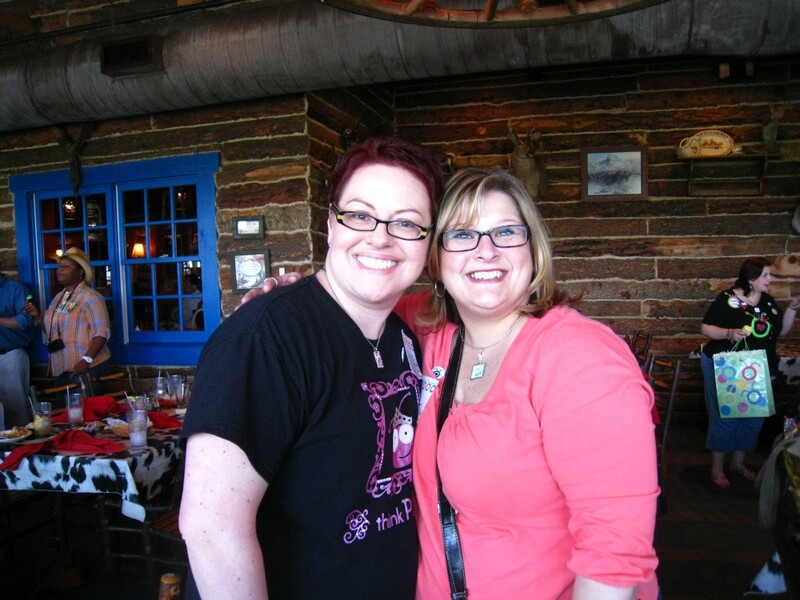 It was so great to meet you, Hope!! Today, I got up early and started getting ready for my 10am class that I was scheduled to teach. I had some "hiccups" with the preparations, but it all got worked out and the class was great. I had about 30 ladies, and taught them all about the Expression functions and modes and whatnot. They seemed to have fun and said they learned a lot. 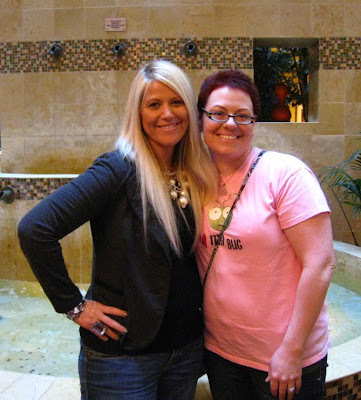 Before the class, I was getting breakfast in the hotel and ran into Teresa Collins. We had hung out with our groups the past couple evenings, so had gotten to know each other a little bit. So the two of us found a table together, and had breakfast and just chatted away. It was so much fun, and she's just a really neat, positive, honest and down to earth person. I truly enjoyed getting to know her. Teresa Collins and me after breakfast. She's a sweetheart! That's about it for now. We're pretty wiped out, but in a good way if that makes sense. We'll catch a plane back to California tomorrow and then I'll be able to jump back in to my emails, etc. So I apologize if you've emailed me in the past few days and I haven't gotten back to you yet - I will work on getting caught up Tuesday! Oh, and let's not forget to announce our blog candy winner from last week! 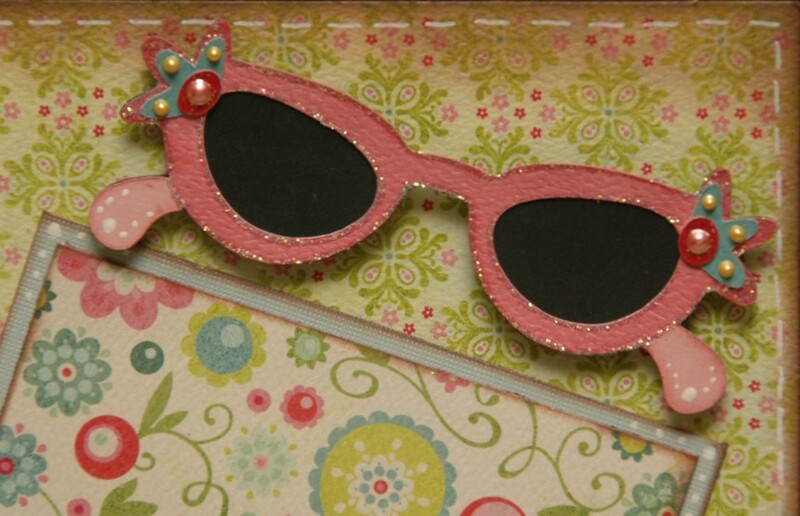 This person won a My Mind's Eye "Good Day Sunshine" paper pack with some coordinating Bo Bunny cardstock. Be sure to email me with your shipping address. My email is moniquegriffith@yahoo.com. Congrats!! Tomorrow I will announce this week's new blog candy, but you can start leaving comments today to be entered for the week. Love the LO, Wendy!! Great job!! We are here in Frisco, Texas, and having an amazing time! Nana Susan and I arrived last night, and just had a quiet dinner out at Macaroni Grill. After that, we hung out with Tammy Skinner and her crew and helped for a couple of hours making things for the event. Today was the Circle Luncheon, and oh, that was such a blast. 100 Circle members filled a back room at La Hacienda restaurant. So many familiar faces and names were there, and the energy was just so hyped up and fun. The food was delicious, and they even gave out a bunch of prizes. 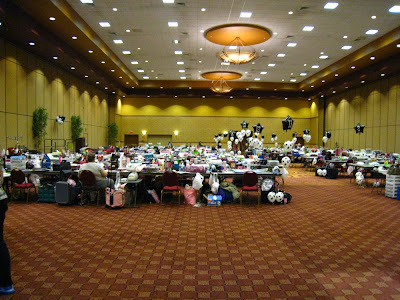 Later in the afternoon, we helped out with registration as all of the ladies arrived at the hotel and brought all of their cropping supplies in to get set up. I loved doing that because it was so nice getting a chance to start putting some names with faces. From 6-8pm, we worked on setting up our table in the Creative Critterz store, so we'd be all ready when the store opened. I'd had SO many people ask about the Stampede Layout kits, so I knew those were going to disappear quickly, and they did! I brought 35 of those, and they are GONE! (If you emailed me to have one shipped - don't worry - I left yours at home safe and sound.) Seriously almost half of our kits were sold within 2 hours, which is fantastic! We're really hoping they'll mostly sell out so we won't have to ship any home! That would be awesome! Anyway, here's a few pics from today, and I'll take more tomorrow too. 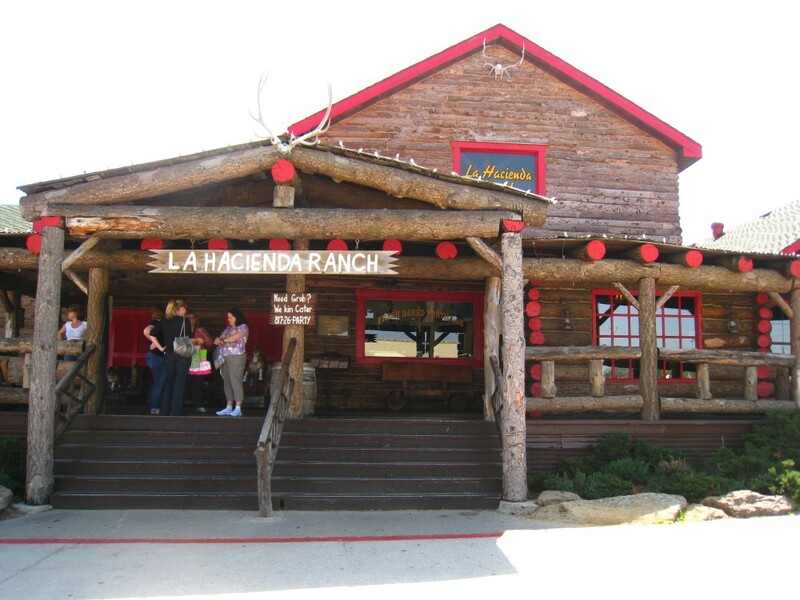 La Hacienda where the Circle Luncheon was held. Look who I found! It's my buddies Melanie and Joy from Everyday Cricut! 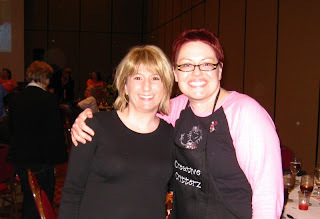 Here's me with my "Pizza Pal" Jenny Kozar. Why is she my pizza pal? 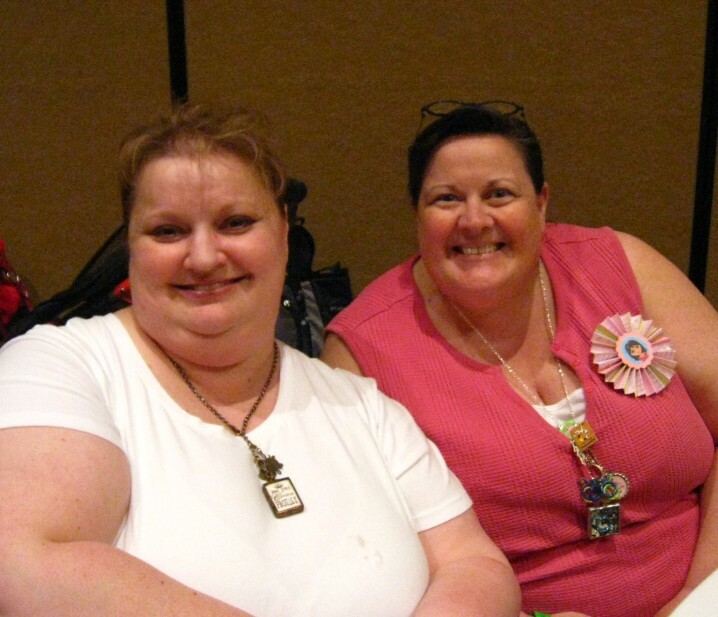 Because last July when I couldn't go to CHA because of the chemo, she overnighted me 2 Chicago stuffed pizzas from the pizza joint where they were all meeting. Isn't that so sweet? And here's Kristen Long. She's a real sweetheart too! 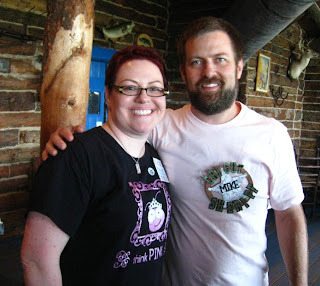 Me with Mike Wigton from Provo Craft. Hope you're all having a great weekend. We sure are! Keep checking back for more updates on all the fun!